A chlorine-free spa and hot tub sanitizer. Managing the use of Biguanide, in spa, swim-spa or hot tub water!!! Biguanide (PHMB) is the generic name of some of the more popular non-chlorine, non-bromine chemical sanitizers used in spas: products such as Baquacil, Soft-Swim and Revacil. While it is a popular alternative to traditional chlorine sanitizers, it does have a host of shortcomings. Conversion requires the addition of chlorine or draining. Sanitizing is a must, for proper spa water management. Salt Chlorine generators are a better way to utilize chlorine, producing more controllable results. They eliminate the need to handle, measure or store chlorine products, while reducing buildup problems. An Electronic PockeTester Kit is a convenient way to monitor the salt level, as well the overall water chemistry. How to sanitize a spa or swim spa without chlorine? Biguanide (PHMB) is the generic name of some of the more popular non-chlorine, non-bromine chemical sanitizers: products such as Baquacil, Baqua-Spa, Soft-Swim and Revacil. The main advantage is that no chlorine or bromine is required and there is little chemical odor. However, it does cause foaming, which can interfere with proper and complete sanitizing. To truly sanitize a spa or hot tub, all foam much be eliminated, at least daily. Biguanide is an effective bactericide and can replace chlorine or bromine in that function. However, chlorine or bromine are also oxidizing agents that can destroy organic contamination: biguanide cannot destroy organic contamination and, therefore, concentrated hydrogen peroxide must be added to the spa or hot tub on a regular basis. A disadvantage of biguanide is the development of biguanide-resistant micro-organisms, after several years of product usage. This usually takes the form of a pink slime or water mold and the only recommended treatment is the application of large amounts of chlorine and/or non-chlorine shock. This treatment destroys all of the biguanide present in the water. Restoration of the biguanide regimen can risk a return of the problem and, therefore, a permanent switch to chlorine or an alternative form of sanitation should be considered. The trick is in understanding that recurring water quality issues are a clear indication, that a switch to an alternative spa sanitizer is required, and not be talked into staying, with what could become an expensive course. If problems arise, refer to the Spa Problems Page, as a source of problem-solving information, broken down into various categories. Scroll down the page and click on the linked keywords, catch phrases or images, in the archived answers below, to access additional information, on that topic or product. ► Biguanide Testing Made Easy? The test strips are convenient, but some people may have trouble reading the colors. 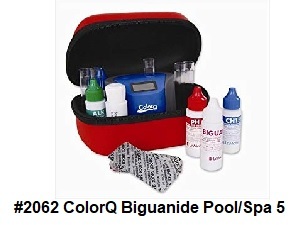 For a better testing option consider using the ColorQ Biguanide Pool/Spa 5 Water Analyzer. It is hand-held, all-digital and requires no color matching or look-up charts. It is quite reasonably priced and easy-to-use. In addition to testing for biguanide, it tests the pH. total alkalinity, calcium hardness and Biguanide Shock levels. It's the perfect tester, for those with any color vision impairment! I hope that this information will prove helpful. My wife seems to be sensitive to chlorine. I've tried bromine and that seems to be no better. Could biguanide make enough of a difference? Please advise. Biguanide is an alternative to chlorine and bromine. It is based on a totally different chemistry. Actually, with biguanide you will not be able to use any chlorine or bromine - even for shocking purposes. A spa on biguanide can only use concentrated hydrogen peroxide for shocking purposes. In your situation, biguanide is worth considering. I suggest that the spa be emptied completely and cleaned before starting on biguanide or another alternative spa sanitizer. There are some other alternatives to chlorine and bromine to consider: products such as mineral sanitizers, solar UV sanitizers or ozone generators or a combination. Look through the archives, on these topics, for more information. Good luck. Water mold is caused by a microorganism that has, unfortunately, become resistant to the biguanide. In order to treat the problem, I suggest that you drain the spa and refill with fresh water. Add some quick-dissolving chlorine or non-chlorine shock and make sure that at least a 1-3 PPM level of Free Chlorine persists overnight. Add more shock, as necessary. This will destroy the water mold on the surfaces and in the lines. Resuming maintenance on biguanide will require that you once again drain the spa, refill and start from scratch. Once a biguanide-resistant microorganism has developed there is no guarantee that it will not return, even after successful treatment. For this reason, I suggest that an alternative sanitizer be considered: chlorine, bromine. salt chlorine generators, ozone generators, mineral sanitizers, ultraviolet sanitizers or a combination or products. Otherwise, you just might get the problem back, in spite of your best efforts. I hope that I have been helpful. Good luck. A Solar UV Sanitizer helps reduce the overall chemical usage. Keep the filter cartridge cleaner, with an automatic cartridge cleaner. Get reliable all-digital test results, with a ColorQ photometer test kit. A salt chlorine generator offers more control, with less odor and better results. Ordinary light activates this product, allowing it to assist in sanitation. Use a 21st Century approach to water clarity, with new Nano-Technology. Just attach to a garden hose and watch the dirt just fall away. ColorQ testers eliminate all the color matching and guesswork. I am having a problem with my hot tub. I have just switched over to biguanide as my sanitizer, as my wife has developed a reaction to chlorine and bromine. I cleaned and fill my tub 5 days ago and have a high pH reading. I have been adding a granular pH reducer ever few hours for 3 days and can not get the pH down. I am also getting a reddish brown scum around the tub. This scum is very sticky to touch and hard to remove. Can you give me some help. My tub is located indoors. Is this a factor? Thank You. There have been some reports of problems with some brands of test strips. I suggest that you have the pH verified by a local spa dealer. There is no reason that the pH should be unable to be lowered. The LaMotte Insta-Test Strips or ColorQ all-digital testers do not seem to have any problems testing the pH in a biguanide sanitized spa. The reddish deposits could be iron. Have the source water tested. If may be necessary to treat the water. The problem may disappear if the pH is lowered. The reddish deposits are very likely to be a bacterial slime, due to inadequate sanitation. Check the sanitizer level. Adding shock may be necessary. Biguanide is a reasonable chlorine/bromine alternative for sensitive people. However, long term use may cause sanitizer-resistant microorganisms to develop, requiring a switch. You might consider using an ozonator and a mineral sanitizer. It will be close to chlorine free sanitizing, but better results probably require small additions of chlorine and/or non-chlorine shock. Another alternative is a Solar UV Sanitizer, which is chemical free and will reduce the usage of more traditional spa sanitizers. However, a Solar UV Sanitizer must be used in conjunction with other persistent sanitizing products. Good luck and I hope that this information proves helpful. What is biguanide sanitizing that you mentioned? You suggested against it, but I've never heard of it. I've been using chlorine, but considered switching to bromine. It sounds like you prefer bromine. I've been adding a lot of chlorine, much more than the dealer said I should have to add. I test the water every couple days and need to add chlorine. A friend has a very old hot tub and adds chlorine once a week. Biguanide is an alternative sanitizer, based on a chemical other than chlorine or bromine. It is based on the polymer PHMB (poly hexamethylene biguanide) and can be useful for people with chlorine or bromine sensitivities, but is, otherwise, not something that I would suggest: cost factor, tendency to foam and possible development of resistant microorganisms. I do prefer bromine over traditional types of chlorine: less odor and less irritation potential. How much chlorine a spa will require is more directly related to how the unit is being used, than by its size or age. If you are looking to improve your spa sanitation and simplify maintenance, I suggest that you consider adding a salt chlorine generator. It is the better way to do chlorine. We offer several models and 2 of them have chlorine detection technology, which means they only produce chlorine, when it is actually needed. In general, salt chlorine generators avoid some of the negative properties, of chlorine usage, and provide better control and results. I hope that this information proves helpful. ► Milky White Spa Water? OK - I haven't seen this one before. I just bought a new house with a 300 gallon spa. The owner drained and refilled the tub just before we moved in. The water tested OK and looked beautiful. My wife and I climbed in, turned on the jets and everything was just fine. Then I turned on the blowers and everything turned milky white. I have shocked and waited, but no improvement. After this the water still looks great when only the filter or jets are running, but as soon as you hit the blowers, it happens again. Any help is appreciated. Oh yeah - biguanide chemicals in the water. Two possibilities. The blower lines are coated with a biofilm (mold, bacteria, etc) and some of it is loosened when the blower is turned on. The other possibility involves the biguanide itself: this material has a tendency to foam and the blowers may be creating zillions of micro-bubbles that cloud the water. To deal with the biofilm, you will need to shock with hydrogen peroxide and let the blowers operate to clean the lines. So far as the foaming due to the biguanide is concerned, you may be able to control it by the addition of an antifoam. If none of this works, it is possible that you have a water mold problem that has become resistant to the sanitizer. Such problems are not uncommon with biguanide. If that is the case, you will have to switch from biguanide to another sanitizing method. My suggestion would be to use an ozonator and a mineral sanitizer with bromine or a salt chlorine generator. I have no doubt, that you will be happy with either method. By adding a Nano-Stick Clarifier, you will be able to get better water clarity, while reducing chemical additions. The Nano-Stick lasts for 4-6 months. I hope that this will clear things up. ► Not Wanting To Continue With Biguanide? Dear Alan, I could not find this question addressed anywhere, so here goes. We bought a spa 6 mo. ago and it arrived with a Biguanide Spa start-up kit. Our spa has an ozonator and we have used the chemicals with relative success. However, they are pricey. We heard from a spa salesperson that simply dropping a bromine tablet into the filter area once a week. That sounds too simplistic to me. I know that there are pH levels that need checked and maintained and also shock treatments that he never mentioned. What do you recommend I use? What to do? Bromine, Chlorine or Non-Chlorine Shock can never be used with biguanide. Drain the spa and refill and don't add anymor e biguanide. If your ozonator is working properly, you should be able to get by quite easily with just adding some bromine. To use bromine, you need to get rid of the remaining biguanide. I suggest that you consider adding a salt chlorine generator, which is a complete sanitizing system. It is the better way to do chlorine. We offer several models and 2 of them have chlorine detection technology, which means they only produce chlorine, when it is actually needed. You could start by draining and cleaning the spa, which is something that should be done every 3-4 months, in any event. This way you start off with a clean slate. An ozonator will allow you to use less chemicals to maintain a satisfactory bromine level: 2-3 PPM should suffice, as compared to 3-5 ppm without the ozonator. However, you will still have to maintain the pH, total alkalinity and calcium hardness. The good news is that because you are adding fewer chemicals, the water balancing should be easier. Don't drop the bromine tablet in the skimmer, as it might add to the possibility of heater corrosion. Use a floating dispenser. I hope that I have helped. I would like to stop using biguanide and switch to an Ozonator and an Ionizer. I want to use as few chemicals as possible. Is there anything that I should do before switching over? Thank you. Spa water has to be replaced on a regular basis, so you might as well start there. That way you start with a clean page and avoid the chemical buildups, that may have previously occurred. Thereafter, the spa water should be changed on a regular basis depending upon your usage patterns or at the first signs of a loss of optimum water quality. In any event, not more than 3-4 months is recommended without a water change. Enjoy the spa. ► Cloudy Spa Water And Water Mold? Alan, about 3 years ago we bought and had installed a spa (435 gallons) on our screened in porch. We first used bromine as a sanitizer, but due to the drying effect on our skin we switched to biguanide. This was done about 2 years ago. About 8 months ago we developed a problem with what we believed to be white water mold. We used a sodium bromide and thought we had it cleaned up. We also started using another product on a weekly basis to try to keep it cleaned up, but it came back. About a week before Christmas my chemical supplier recommended that the spa be drained, refilled and a strong chlorine shock be added and allowed to remain in the spa for 24 hours. This was done. We were to then drain, clean and refill with fresh water. This was done. After 48 hours we added the appropriate amounts of the chemicals used in the biguanide system. The pH was adjusted to 7.5, TA was @100, calcium hardness was 250, and sanitizer was at 50. In less than a week the water was looking very hazy and we could not see the bottom in the spa. The spa was used once during this time. I again drained an cleaned the spa. Again, everything was brought up to specs. This water was clear as a bell on Dec. 31. It was used Dec. 31 and again on Jan. 1 and the water was absolutely milky looking on Jan. 2, and has gotten even worse as of today, Jan.4. I have added shock and clarifier which made no difference at all. I have no idea what else to try. I am thinking about going back to bromine. I understand that the biguanide people have a new bromine system out there that is not as rough on the skin. Maybe I should give that a try. Do you have any ideas on this one? Thank you. The water mold and the resultant cloudiness are the result of the formation of a biguanide-resistant microorganisms. The cleaning and treating with chlorine are only temporary: it is resistant to biguanide and will, in all likelihood, return quickly. I suggest that you permanently switch from biguanide to another sanitizer. To reduce the chemical effects of bromine you should add an ozonator, as this will allow you to maintain proper conditions with much lower bromine levels. To almost completely eliminate bromine, you could use an ozonator and with a mineral sanitizer. A very low level still is suggested, for best results. Another convenient option would be a salt chlorine generator. In any event, it is time to move past biguanide. I hope that I have been helpful. We recently switched to biguanide and an ozonator in our spa as my wife has developed a rather severe sensitivity to the shock used for chlorine and bromine. The rash problems have disappeared and we are back to enjoying the hot tub - very timely, as it's been -30 to -45 here for the past week. However, after about three weeks of use, the water has taken on a yellowish tint. The water is crystal clear, but a slight yellowish in color. We've tested the water for pH, alkalinity, hardness, and sanitizer level using test strips and liquid kit testers. As well, we took a sample into the spa dealer for water quality testing. All readings are normal and within the ranges recommended by both the spa and biguanide manufacturers. Mineral tests on the water showed no iron or copper in the water. No one could definitively identify the source of the problem. When we reported the sanitizer (biguanide) level of 30-50 to the spa staff, they recommended that we reduce the amount of biguanide we are adding to about half of the recommended dose. We did follow this practice when we were using chlorine and bromine sanitizers. However, the biguanide manufacturer does not recommend this procedure. Bottom line, Alan - can we reduce the amount of biguanide in the hot tub and will that affect the water color? Any help you can provide is greatly appreciated. Thanks. There are a few things that are not clear. While using biguanide, did you add chlorine or bromine? Ordinarily a yellow color is indicative of iron. Did you use well water? Even though the test showed no iron, it is still possible that iron is present, but that the test is being interfered with by a chemical present in the water. I suggest that you have the source water tested for iron. Get back to me with this information and I'll have more to relay to you. The yellow color could be indicative of decomposition of the biguanide. To clarify, we used only the products recommended by the biguanide manufacturer. No chlorine or bromine, or any other chemicals added. The only thing we have put in the water (besides ourselves) has been biguanide sanitizer, shock and waterline control - and only the recommended amounts at the recommended times. We had had a slight rise in the pH readings for the first two weeks that we controlled by adding about 15 g of pH down every 4 or 5 days, but this problem now seems to be under control. We are using municipal water that has been tested and shows no iron or copper, alkalinity of 110 ppm, hardness of 100 and pH of 7.3 - with the exception of hardness, all within acceptable range. When we had the spa water tested by the spa manufacturer, their computer program came back with "yellow color caused by yellow or mustard algae" and recommended the addition of an algaecide. We talked about this possibility and didn't think it sounded reasonable, as it is the dead of winter here and nothing is growing. Again, any help you can offer is greatly appreciated. Thanks again. You definitely don't have mustard algae. It shows up as a powdery deposit on the walls and bottom. If the shock that you are using is anything other than hydrogen peroxide, such as chlorine or non-chlorine shock, it could account for the problem. The use of an ozonator and biguanide is not common and may be part of the cause of the problem. When biguanide is oxidized, it forms colored decomposition products. This may or may not be the case. At the very least, the biguanide will add to the foam level and possibly interfere with the venturi effect, by which ozone is added to the spa. My recommendation would be for you to empty and clean the spa thoroughly, removing as much water as possible. Upon refilling, I would stop the use of biguanide. Because you want to avoid chlorine and bromine, I would strongly recommend that you use a mineral sanitizer, in conjunction with the ozonator. This will provide complete sanitation, without chlorine or bromine, on a regular basis. Occasional shocking with chlorine is suggested, as is the maintaining of a very low free chlorine level. You not use non-chlorine shock (MPS), when required, because I have had anecdotal reports of rashes, due to excessive usage of the potassium monopersulfate shock. This might have been the problem, from the start. Many biguanide users find themselves forced to switch after a few years because of the development of biguanide-resistant microorganisms. I hope that this information will prove helpful. I have an allergy to bromine in our hot tub and the chemical biguanide has been suggested as an alternative spa sanitizer. Can you tell me what this chemical is? Thank you. The active chemical is a polymer called biguanide: abbreviated PHMB. This material is incompatible with chlorine or bromin e and is a popular alternative to these sanitizers. While it does function as a spa water sanitizer, it cannot perform the necessary oxidizing action that is needed to destroy organic wastes and accumulations. For this purpose liquid hydrogen peroxide is used. For someone sensitive to bromine this is a reasonable alternative. Another viable alternative spa water sanitizing method would be the use of a salt chlorine generator, which is the better way to do chlorine. Bromine tablets contain a chemical called dimethyl hydantoin, which is not present in chlorinated pools or spas. That being said, the allergy may have been due to the dimethyl hydantoin and not to chlorine or bromine. Unless you went into a bromine pool or spa, you would never have encountered this chemical. I hope that this information proves helpful. My spa was supplied with an Ozonator already installed. I currently use some bromine to act as a back up. Would it be possible to stop the bromine and start using biguanide as a back up? I think that my wife is sensitive to bromine and chlorine. Thank you. Yes, you can use biguanide and ozone based on a leading biguanide manufacturer's recommendations. I suggest that you start by draining and cleaning the spa. That way you'll get rid of all of the bromide salts and start off with a clean slate. You should maintain the typical level of biguanide, because the ozone, being produced, quickly leaves the water. Follow the directions on the label and test daily, until you get a handle on how much biguanide you need to add periodically. Biguanide has a tendency to foam and that could interfere with the venturi (vacuum siphon tube) effect, by which ozone is added to the water. There is another possibility that you might want to consider. Why not use a Mineral Sanitizer with your ozonator, instead of biguanide? If sensitivity to chemicals is a consideration, this makes a lot of practical sense. Browse through the archives for more on the topic. Good luck and I hope that I have been helpful.